Very cute, would love to win it! Thanks so much for the opportunity. Love your site and info! Ew-how creepy! I was just in the ER this morning for a spider bite. I would use this gift card for alot of insecticide. This gift card would come in handy, seems like I can’t get out of Target without spending at least $50! Love bugs, love this giftcard! Thanks for the awesome opportunity each week to win these awesome gift card. Thanks for a chance to win every week!! Some days you’re a bug, some days you’re a windshield. you’re awesome! thanks for this opportunity. And I totally ‘LIKE’ Totally Target, too! We could totally use this! Thanks for letting us try! Would love to not have to pay out cash for a few trips to Target! $50 what i could buy with that. 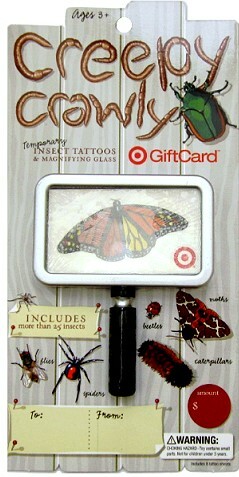 My 2 yr old daughter would love go “buggy” over the tattoos and magnifying glass. She is sooo into insects…the other day she saw a spider on the wall which was dead and she said “Mom, his legs are broke, you need to carry him outside to his family.” It melted my heart! Thank you so much for all your generosity with give aways!